German Orders of Battle on 5 April 1941 at the attack on Yugoslavia and Greece. 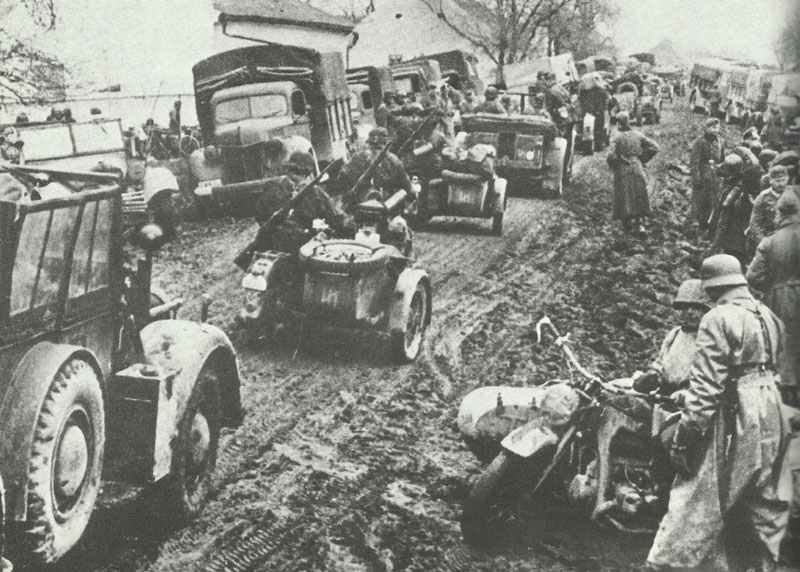 German advance on the muddy roads of Yugoslavia. In order to secure his southern flank for the invasion of Russia Hitler forced Yugoslavia’s Prince Regent Paul into the Axis alliance, but when he was overthrown by anti-German patriots in Belgrade, Hitler ordered the invasion of Yugoslavia and the expulsion of the British from Greece. Operation Marita, the invasion of Yugoslavia, was launched on 6 April 1941 (after a mere ten days of preparation) and was a complete success; for the loss of 558 men the Yugoslav Army was completely destroyed, and over 300,000 men taken prisoner. Simultaneously, five divisions of List’s 12th Army invaded Greece and by the end of April the country lay in German hands, although losses here were rather higher, at just over 5,000. The Wehrmacht’s victory in the Balkans was due to the imaginative handling of armoured and airborne forces against the armies of a disorganised enemy. It can be seen from the Order of Battle further down that the German Army Corps was a very flexible structure, which could be composed of a variety of different formations to suit local needs: XVIII Corps, for example, was composed of two mountain divisions and one panzer division, specifically for operating in difficult terrain. The divisional organisation of the German Army was much the same as it had been in 1940 with the exception of the panzer formations which were reorganised to include a better balanced infantry element, to avoid the problem encountered in France in 1940 when unsupported tank units raced on ahead of the foot-slogging infantry. The panzer division now had one tank regiment, two motorised infantry regiments and stronger supporting units which included self-propelled anti-tank guns and artillery. It was 15,600 men strong and had an establishment strength of 211 tanks. The Panzer III and Panzer IV tanks now formed the striking force of the panzer division. 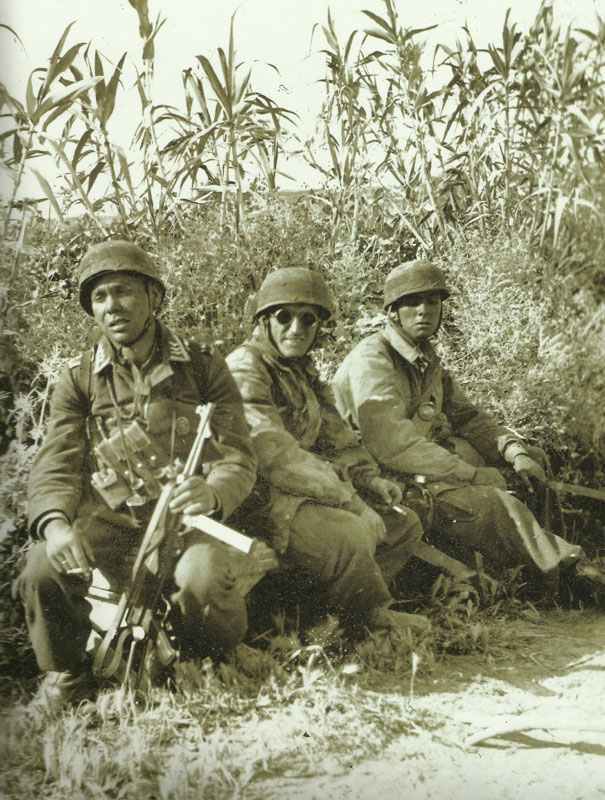 Cigarette break for three completely exhausted paratroopers from the battles around Heraklion on Crete. After the success of the paratroopers in Holland and Belgium the XI Air Corps was officially formed in summer of 1940 under the command General Kurt Student. The new formation was first employed in action during the German invasion of Greece when the 2nd Parachute Regiment was air-dropped over the Corinth canal in an attempt – unsuccessful as it turned out – to secure the single bridge over the canal. Control of Greece was not control of the Mediterranean, however, and plans were drawn up for the invasion of the strategically important island of Crete. The XI Air Corps would be the spearhead of the assault: the invasion by some 22,000 men and over 500 transport planes as well as seaborne forces began on 20 May 1941 and after 11 days of bitter fighting, in which the Germans suffered 3,250 dead or missing and 3,400 wounded, the Allied forces evacuated the island, leaving over 10,000 men as prisoners. The capture of Crete was one of the greatest triumphs of the airborne forces but the very high casualties of this parachute operation so shocked Hitler that from then on these elite troops fought mainly in an infantry role. After the invasion, the 7th Air Division was withdrawn and re-posted to the Eastern Front, being replaced by the high-quality 22nd Infantry Air Landing Division, an otherwise normal infantry division trained and equipped for air transport, which had been unable to participate in the assault. The first deployment of the German Air Force in the Mediterranean was the arrival of the X Fliegerkorps from Norway in December 1940 to provide support for the ground forces in North Africa and cut off the British supply routes in the Mediterranean. For a time the German Air Force had control of the skies, its Me 109s proving more than a match for the RAF’s Hawker Hurricanes. In the Balkans the 4th Air Fleet of 1,200 aircraft supported the German Blitzkrieg with great success and contributed to the hard-fought victory over Crete. Large numbers of aircraft from both the X Fliegerkorps and the 4th Air Fleet were withdrawn for the invasion of Russia, however, leaving the Luftwaffe desperately short of aircraft in the Mediterranean. Infantry guns 25 (6 x 15cm, others 7,5cm) 25 (6 x 15cm, others 7,5cm) 14 (2 x 15cm, 12 x 7,5cm) 10 ? Tagged 1941, germany, luftwaffe, wehrmacht.